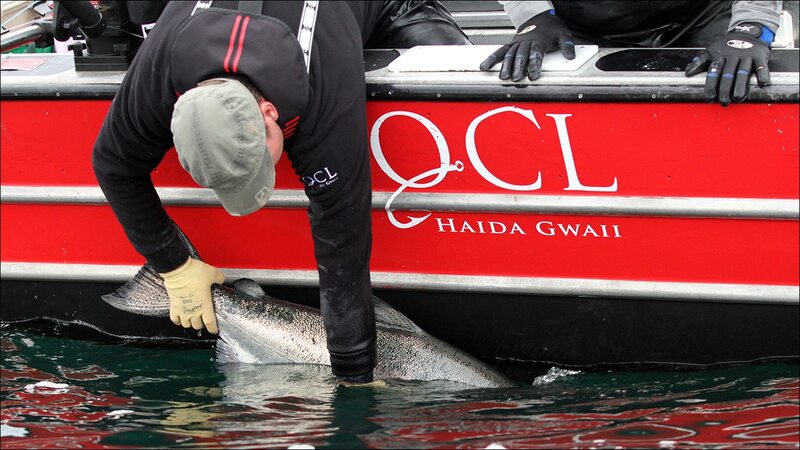 Late July, early August… favourite dates for many QCL anglers and they’ve been finding some stunning fish this week! Moderate northwesterly winds bring blue skies and warmer temps and tend to drive the bait into the sheltered waters of Virago Sound. And that’s where we are, ready for the salmon that follow the huge masses of needlefish and herring that fatten them up through the home stretch! 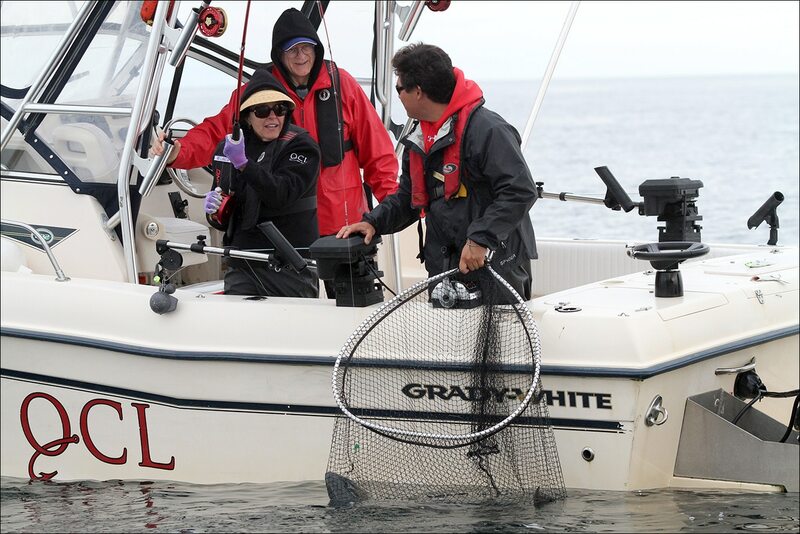 Chinook action has been best along the classic fishing points, with anglers trolling anchovy and herring baits down 35 – 45 feet to find them. Cape Naden is a steady producer with Klashwun Point, Bird 2 and Parker Point doing just as well on most days. 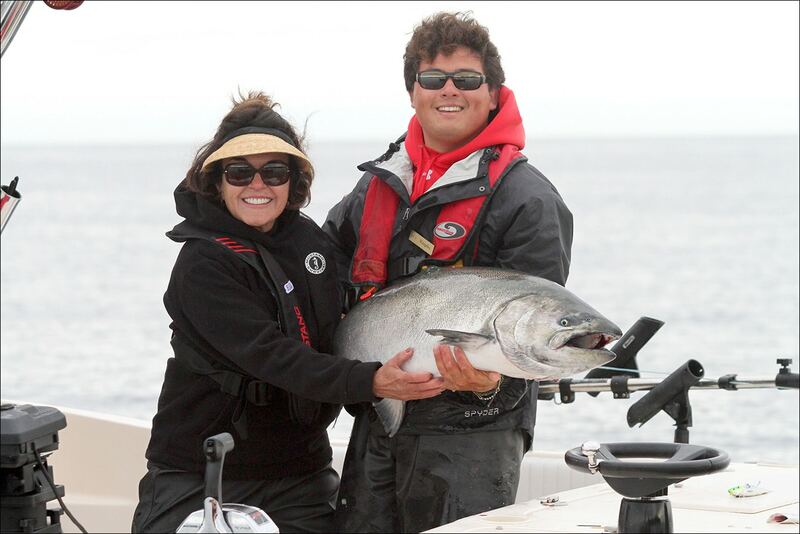 Linda S was thrilled to return a fish of a lifetime to the water this week after landing a stunning Tyee that taped out to 44 pounds. 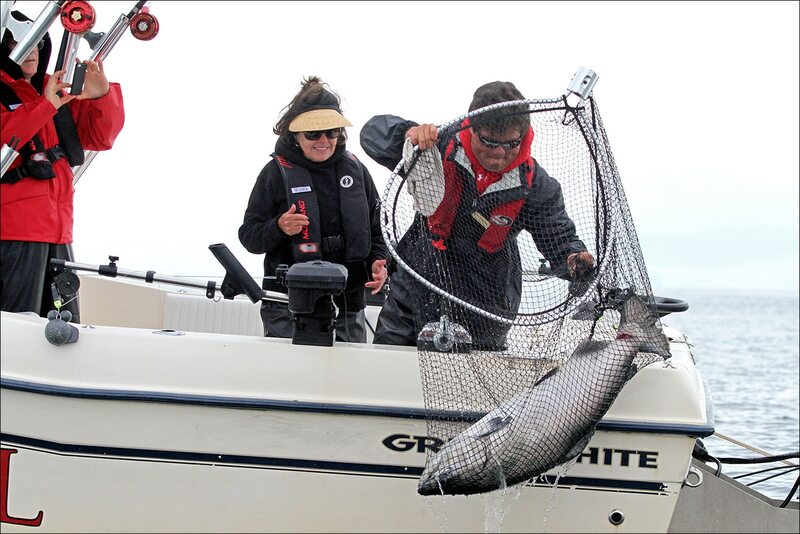 Guide Kingsley Brice carefully revived the big beauty off Klashwun Pt. and away she went! Fantastic work Linda! 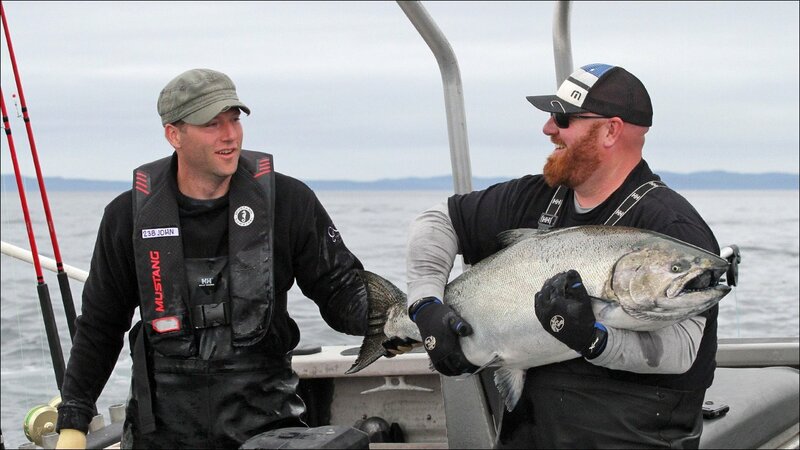 Terry H shared this experience with a 40-pounder on Monday when his guide Coady Delesalle sent back a big Chinook for him. 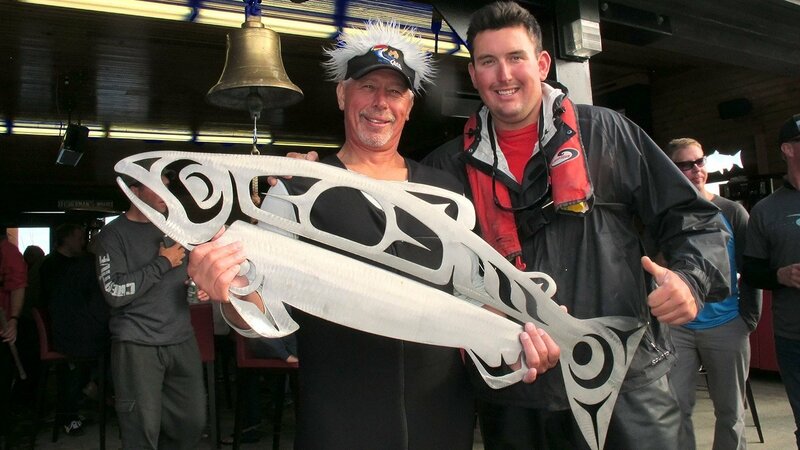 The Tyee bell has been ringing loud on many nights with some stellar catches coming back to the scale. 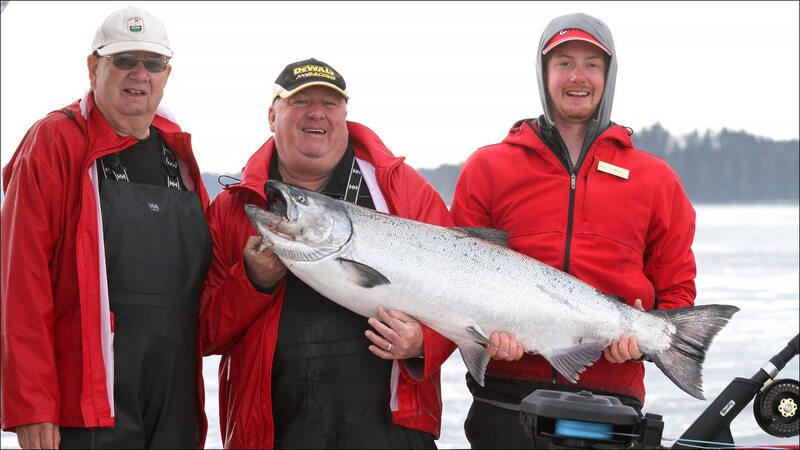 Ralph S weighed in a 50 lb. 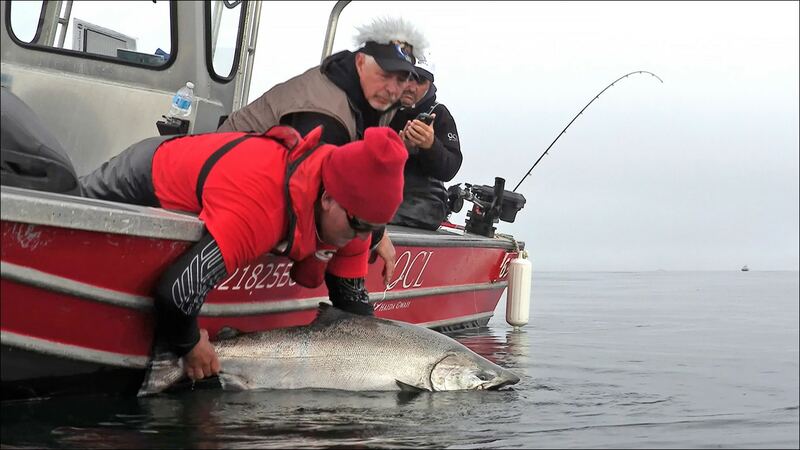 Chinook on Tuesday while Jamie R was unable to revive his huge chrome Tyee that came in at 52 lb.. Greg E was more successful releasing a 44 pounder at Klashwun Pt. with his guide Jordan Grames on Wednesday. 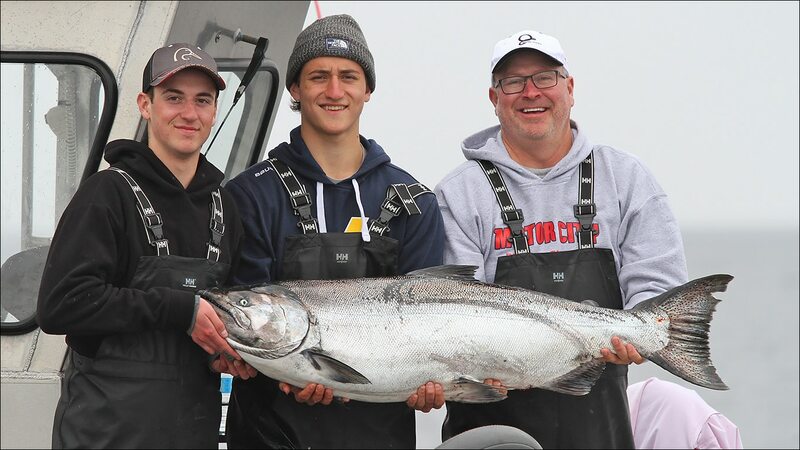 Fishing without a guide this week, Kent H and his bud John W hooked up a monster Chinook in the busy water between Shag Rock and Klashwun. After a 25-minute battle John scooped the massive salmon. 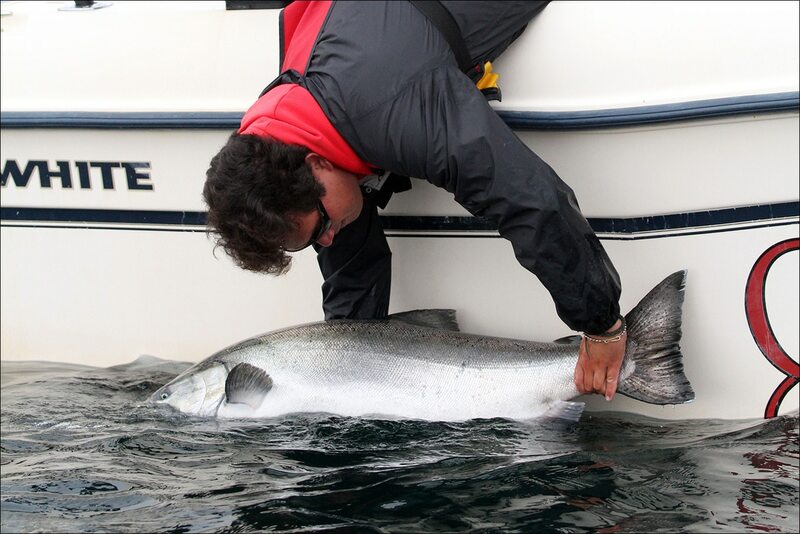 They quickly measured and released a contender for big fish of the season, a heavy shouldered Tyee that scored 64 pounds! And what a beautiful fish it was! Fantastic work guys! 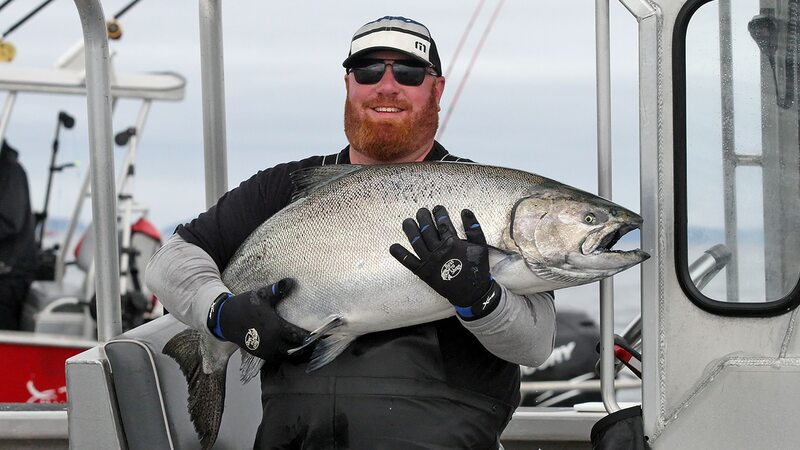 Finishing the trip with another awesome release was Daryle A who connected with a bruiser off Bird Rock on Thursday, his guide Brett Clarke taping the trophy fish out to 52 pounds before releasing it into glassy calm water, all captured in 4K video! Beautiful work gentlemen! Congratulations!